A new survey has found that a third of Canadians would use a mobile wallet if it was provided to them by their bank — but there is less interest in mobile wallets provided by other potential types of issuer. 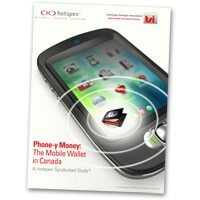 A survey of more than 1,000 Canadian mobile phone users and smart phone intenders suggests that more than a third of this group of consumers would use a mobile wallet if it was offered by a bank. If the mobile wallet was issued by others in the emerging mobile payments ecosystem, however, usage intent is less favourable. The ability to store multiple, and potentially competing, payment mechanisms in the wallet. The ability to set payment preferences by type of merchant, for example, selecting which payment instrument would be used at restaurants and which at grocery stores. The ability to get notified of discounts and special offers on an ‘opt-in’ basis. That a mobile wallet may obviate the need for users to carry their bulging physical wallets with them. The effectiveness of using a mobile wallet at the point-of-sale — some see it as more time consuming than that offered by current payment options. The complexity of managing multiple payment instruments and multiple pre-selected vendors in the wallet. The potential for the mobile wallet to be a source of spam from m-commerce partners. The threat of being without a payment option available, should the mobile phone lose power. The research also found that, when it comes to likelihood of early adoption, high earners are a quick win with those earning more than C$100,000 and those with a postgraduate qualification responding positively to the mobile wallet concept. “Most of the players in the mobile payments ecosystem are aware that consumer concerns around security are significant barriers to adoption,” says Christie Christelis, president of Technology Strategies International. “But this research revealed some important nuances around the security issue, and also demonstrated how rational concerns about security have a deep emotional impact on consumers — which doesn’t augur well for adoption,” he adds. “It is imperative for those players intending to offer mobile wallets — as well as their ecosystem partners — to design and position the mobile wallet in such a way that it addresses the emotional and rational barriers to adoption”.